Only technical publications are listed below. Saltmarshes are intertidal areas which exhibit complex topographies of sloping flats cut by intricate networks of creeks. These areas are shaped primarily by hydrodynamics but also by biological and ecological factors (Mason et al., 2005). Topography, in turn, conditions and defines the vertical zonation of the saltmarsh and mudflat communities, by determining their immersion/emersion rhythms. Because saltmarshes were long considered wastelands (e.g., Chapman and Roberts (2004)), and because they were often inaccessible and difficult to survey using standard topographic techniques, little to no attention was given to the accurate cartography of those areas outside the main channels. To further complicate matters, these systems are very dynamic, usually rendering the available cartography obsolete, usually within a few years. Detailed knowledge of the topography is necessary for accurate modelling of processes taking place on saltmarshes. Models to compute material exchange and biogeochemical phenomena require detailed information about the topography of the area and the amount of water stored in intertidal areas and released into the tidal channels and estuaries. Furthermore, vertical relief is also paramount in explaining the distribution and variability of the saltmarsh communities, namely halophytic vegetation. The GCE-LTER program is studying biogeochemical processes that change constituent concentrations in water as it flows over the marsh during flood tide and returns the modified water during ebb. The Duplin River is one of the focus areas for these studies (Fig. 1). A high-resolution digital elevation model (DEM) of the Duplin river, with a 1m2 resolution, was constructed through the classification and analysis of a series aerial photographs sets taken during a flood tide. The rationale behind this method is that (1) the flooded area can be objectively recognized and (2) the water surface is horizontal throughout the system and can therefore be used as a reference height (Lohani and Mason, 1999). This report describes the development and results of this DEM. An aerial survey was conducted on 15 April 2004 to obtain data from which the topography of the Duplin River intertidal area could be derived. The survey consisted of a series of 7 passes over the Duplin River at 1-hr intervals, covering low water (LW) to high water (HW). For each pass, a total of eight images were obtained on infra-red (IR) film. The aircraft mission for the Duplin was conducted by Spectrum North Carolina, Inc. The images were scanned at 600 dpi to ensure a pixel resolution better than 1m2. After being rectified to NAD83, TM-Zone17, each RGB 24-bytes/pixel image (corresponding to three 8-bytes/pixel bands: blue (green on the film), green (red on the film) and the red (near-infrared on the film)), was processed to yield the water surface area as a function of time. Sub-surface pressure gages deployed along the tidal creek were used to determine the vertical reference level for the corresponding flooded area. The analyses of these images, reported here, yield a high-resolution digital elevation model (DEM) of the intertidal area from which curves relating flooded area to water level can be constructed for the entire system of tidal creeks. The derivation of topography from images like these was successfully applied to a tidal creek in South Carolina (Blanton et al., 2006) with partial funding from NOAA’s Coastal Ocean Program. Rafts of dead and decaying Spartina alterniflora (i.e., marsh wrack) were mapped from high-resolution aerial photography to determine if docks extending out into the saltmarsh significantly alter the spatial distribution of wrack along the eastern shore of two adjacent islands in coastal Georgia (Wilmington and Skidaway Islands). Both islands exhibit similar physical characteristics, with the exception that Wilmington Island has 101 private recreational docks along the eastern shoreline and Skidaway Island has no docks along the eastern shoreline by homeowner covenant. Each individual wrack raft along the eastern shoreline of both islands was delineated to create polygons representing each wrack raft. Total area, individual area and long-axis orientation of the wrack rafts associated with each island were measured in ARCGIS. On Wilmington Island, wrack polygons were classified as dock-associated or non-dock-associated. Total area of wrack was significantly different between the two islands when examining the dataset, but was not significantly different when the data were normalized to the lengths of the islands’ shorelines. Directional orientation of the wrack polygons was found to be significantly different between Skidaway and Wilmington Islands and when comparing Skidaway Island polygons with the dock-associated wrack polygons of Wilmington Island. The Skidaway Island directional data is not significantly different from the non-dock-associated data from Wilmington Island. Based on these results, it is clear that the presence of docks has an effect on the distribution patterns of wrack in the saltmarsh and alters where wrack impacts occur. Data from this study and Alexander and Robinson (2006) demonstrate that dock shading on the east side of Wilmington Island decreases carbon production by 4-7 x 105 gC/y. Dock-associated wrack accumulations on the east side of the island have the potential to reduce carbon production by approximately 1-9 x 106 gC/accumulation event. These values suggest that the impact of dock-associated wrack accumulation on the marsh may be equal to, if not more, significant than that of private recreational dock shading. We observed several examples on Wilmington Island where derelict, non-servicable structures existed in the marsh which did not provide a public or private benefit, but which still acted to create dock-associated wrack accumulations. Because of the potentially significant negative impacts on marsh productivity created by marsh wrack accumulation, we recommend that no permits for new structures in the marsh be allowed from an individual upland property until all non-servicable structures have been removed. The GA-SC Coastal Erosion Study is a USGS-funded cooperative project that seeks to understand the rates, controls and processes of coastal erosion within the Georgia Bight. Researchers at Skidaway Institute of Oceanography, Georgia Southern University, University of West Georgia and Pennsylvania State University collaboratively investigate these issues in a study region extending from St. Helena Sound, SC to St. Marys Inlet, GA. A State of Knowledge Report, involving the compilation and synthesis of existing data to evaluate the level of our understanding of shoreline change, coastal morphodynamics, shallow stratigraphic framework and geologic resources in the Georgia Bight, was one part of this larger project. This report documents basic and applied coastal research and coastal-engineering-related studies, identifies information gaps and significant deficiencies in our knowledge and prioritizes areas where opportunities exist for future geologic research pertinent to management of a dynamic coastal zone. Back-barrier islands, or small islands between the major barrier islands and the mainland often termed “hammocks”, are geological features that provide important habitat for plant and bird species, including rare and endangered wildlife and migratory songbirds. Approximately 1200 of these islands exist along the Georgia coast, and given the increasing growth along the Georgia coast in the past decade, they are coming under increasing development pressure. Literature searches quickly showed that very little scientific information exists from studies of back-barrier islands to guide coastal managers. This literature review was conducted to identify research carried out on the major barrier islands that could be applied to back-barrier island environments. Population pressure along the Georgia coast has greatly increased the number of docks that extend across the marsh, impacting marsh ecosystems. To understand the patterns and impacts of dock proliferation, aerial photography and field data were used within a geographic information system (GIS) to quantify the number and area of docks and shading impacts by these docks using 1970 to 2000 data from Wilmington Island, GA as a case study. This study provides both baseline and trend data and attempts to extrapolate them for use by coastal managers. As population pressure increases along the Georgia coast, coastal managers require more and better data regarding coastal resources and human impacts to these resources to carry out their mission, particularly in the expansive and productive salt marshes. Understanding the impact of private recreational docks on saltmarsh ecosystems is considered by many to be a critical need, given that these structures shade the marsh and that their numbers are increasing rapidly with little understanding of their cumulative effects. Structures associated with private recreational docks (i.e., floating docks that rest on the bottom at low tide) directly impact estuarine habitat and productivity. These bottom-impacting structures are commonly found in the southeastern US, particularly in coastal Georgia and South Carolina, because of the high tidal range in the region (3 m at spring tide), the strong demand for water access and generous allowances for structure in the marshlands to accommodate this desire. This preliminary study documents quantifiable effects on the benthic environment because of the presence of floating docks, which result in statistically significant changes in benthic algal production (as measured by chl a ), grain size, organic carbon and benthic macrofaunal distributions. 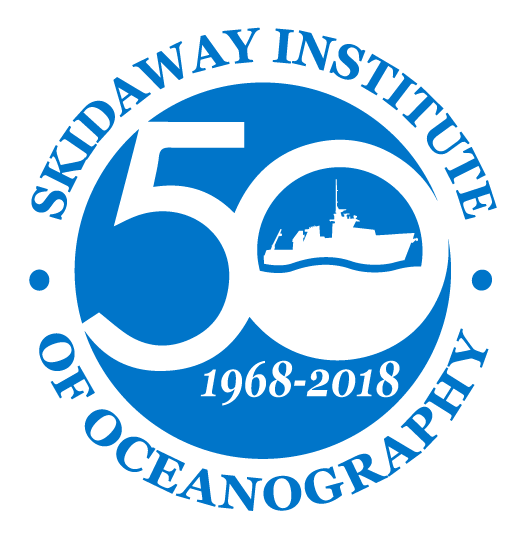 This technical report is a compilation of basic laboratory procedures used in the Wakeham Organic Biogeochemistry Laboratory at Skidaway Institute of Oceanography.